Our latest race excursion was a double header with racing on Saturday and Sunday. In an effort to get to the track early and not be so tired our first day, we decided to leave Friday night and sleep in the parking lot of a nearby Super Walmart. This turned out to be an interesting evening. We stopped in ask for permission, did a little shopping for the next day, brushed our teeth and went to sleep. 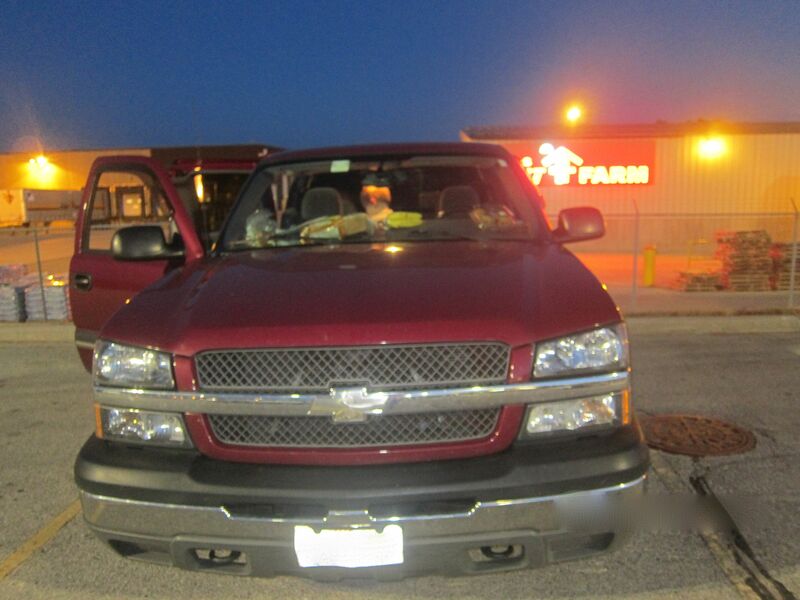 Jason who is under 4 feet slept in the front of the truck and was out within an hour. I, on the other hand, slept in the back and found it was about 6 inches too short for my 5′ 10” carcass. I got some moderately restful sleep and was mostly ready for the day. We both woke up early and were at the track by 7:30 for a 9 am open. Since we had time waiting for the gate to open, I got Jason’s stuff out and he was suited up and ready before we even had our wrist bands. 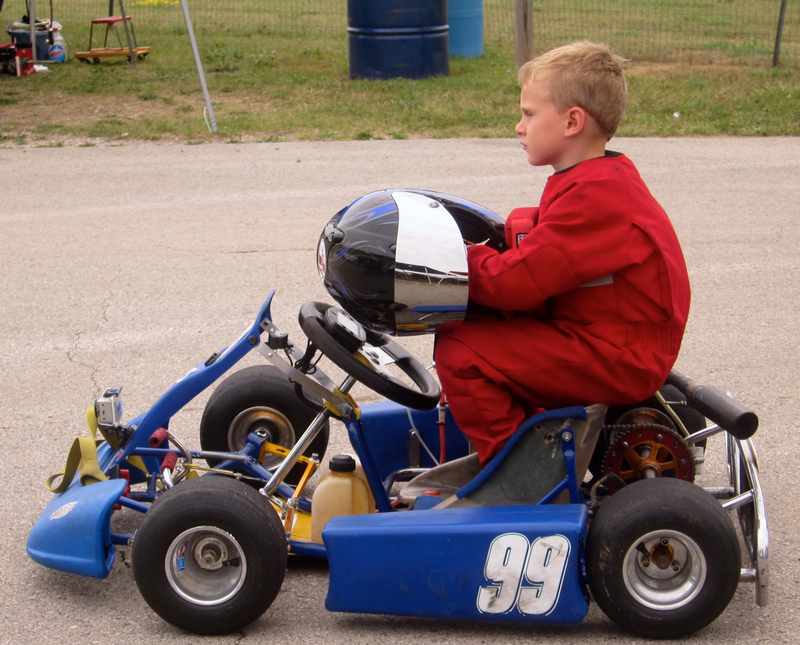 Kid Kart practice starts at 9:15. Usually we are the only ones ready and this time we were well beyond ready. His first practice session was a little slow but I figured it was because it was his first time in the kart since the crash and he was not racing anyone. The second and third practice demonstrated that something was very wrong. He was not able to keep up and was not able to pass slower kids. He was a slow kid. At first, I again thought it was him being afraid to pass but after he kept telling me that the kart was slow, I knew it was not him. At this point, I began working feverishly to figure out the problem. Finally I listened to him and the motor. I could hear that the motor was not hitting the rev limiter down the straight and assumed the problem was there. I changed out the air filter and put in a new spark plug, but it was still not working right. The first heat he took fourth. There was a visitor #5 from Badger who was very fast and gave Logan #42 some good racing, while Jason puttered around. 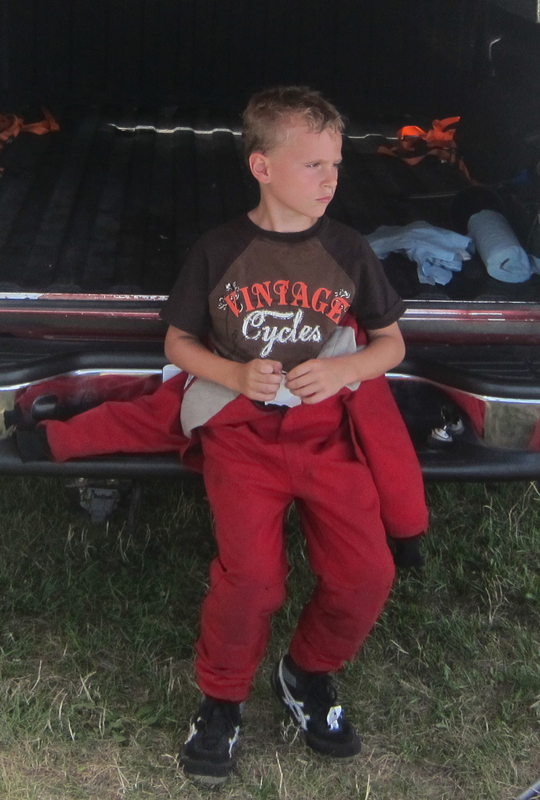 Our friend Easton #4, who is usually a bit slower, was lapping Jason and he was not able to pass a very rookie #17. Before the second heat I had some help from Jim at Fastermotors setting up the carb float. Despite this effort, Jason ran 4th again. He was getting really frustrated with me and the kart. After some more thinking and tinkering we went out for the feature and the results where the same. Logan and #5 raced rings around Jason and the other kids. A very disappointing day. He and I were working really hard and not getting anywhere. After some more discussion with Jim, we looked at the kart setup. He found the toe was 1/4 inch out, toe is the alignment of the front wheels. The kart was pidgin toed, this causes the tires to be pushed sideways down the track instead of rolling. With my help, (i.e., “Steve, please hold this”) he set the toe closer to 0. Jason asked me if he could go for a test run after racing was over. After a brief discussion about the possibility of getting permission, we got his gear back on and he ran down to talk to the race director while I got his kart. On his own Jason politely asked the Race Director Erik, and I explained our troubles, and we were allowed to go out. I figured we should know in 5 or fewer laps if it was fixed. After a 1 lap warmup I told him to go for it. His times were still not where they should be but they were better and the kart looked better too. I was really impressed that he thought about the test laps and made the effort to get permission from the director. After a very cool and pleasant night camping at the track, practice on Sunday was much better. After the first session though, the engine died at the weigh station. I put it on the stand and tried to start it up but instead of running it “peed” gas all over the ground. The float valve had gotten stuck again. So I quickly pulled the carburetor off again (now that I had some more practice) and took it apart to free up the valve. While I was blowing through the fuel intake, Jason asked “What does gas taste like?”, “not good”, I replied. “Thanks for asking!” I got the carb back on. The kart fired right up, sounded better and it was hitting the limiter nicely. The second and third practices went much better, and he was getting back to his old speedy self. We could now spend the time working on getting a faster line and actually racing. The hardest thing about racing with a 7 year old is that he lacks the life experience never mind the language of the track to understand what needs to be done. Trying to explain that he needs to go high here and low there is really hard, frankly Jason can be a little stubborn too. Ultimately, I end up telling him to follow the fast guy, or “stay on the white line till it ends”. After our starting issues at Badger, I thought we could also work on race starts and see if he could jump out at the flag. 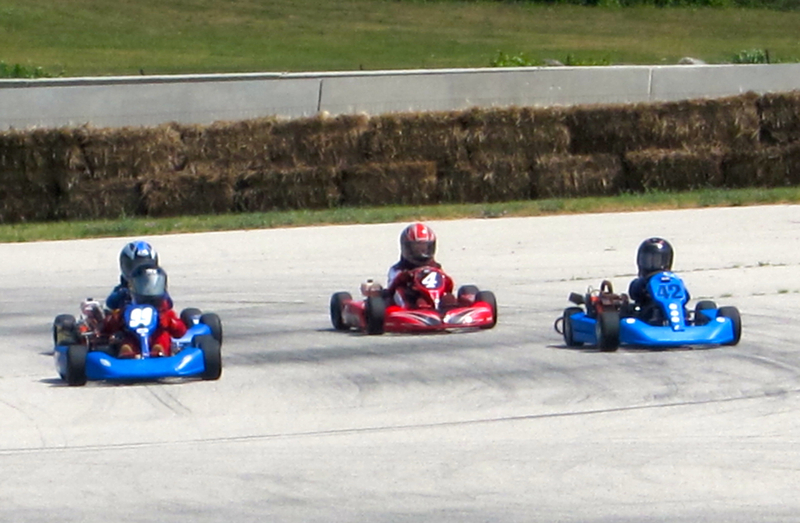 At Road America they do side by side starts without a pace lead, closer to real kart racing. Man did he hit that green flag! He jumped right out in front and was in the lead on the first corner, with Logan (#42) hot on his heels. For most of the race #42 chased Jason down, looking for the a place to pass. Logan found a spot just before the white flag and he finally got by. On that last lap Jason was keeping up and was getting ready to make his move to get the lead back when the chain came off Logan’s kart and he had to pull off. Jason zipped by and raised his fingers in victory as he crossed the line. Not the best way to win, but it is not always the fastest driver that wins. For heat two Jason sat on the pole. Again, we talked about the start and riding the white line in the first corner. Jason had a great start and grabbed the lead again. After a couple of laps #42 got by again and made space between them for the rest of the race. Jason was happy with a well-earned this 2nd place finish. For feature he sat in the second position for the start. He grabbed the lead in the first corner but was passed by #42 in the second lap. This time Easton (#4) was learning the same lessons as Jason and was following Jason’s line. It was going to be an exciting race if they kept it up. As Jason and Easton were coming into the last corner, Jason made a change in his line and imitated Logans line. He entered the corner high, was low in the middle and high in the exit. This gave him with plenty of momentum to fly down the straight when he exited the corner. Easton stayed low and passed Jason in the middle. As they reached the corner’s exit Jason had the speed to pass again. While he was working his way by Easton came up and their karts touched. Jason spun and tried hard to hold on but ended in the grass and into the barrier. He was out of the race. Shortly after that, #42’s chain fell off again, as I learned later due to a busted motor mount. Easton stayed clean and was chased by #17, who was now going faster too, all the way home for his first win. After the race Jason and Easton had kind words for each other, one of congratulations and the other of consolation. Every race and practice we get better. He is really starting to think about racing and driving. It is really neat to watch him pick up new tricks. Despite this weekend full of frustation and disappointment, we had a good time with many adventures. Still need to work on keeping cool and I need to pay more attention to kart setup. We both have learned a lot about karting and can’t wait for the next race. Thanks to Jim at Fastermotors and David Hickman for their help working out the kart issues. Walmart for letting us crash at their place. Also to the guys from Road America that ran some great races and opened the timing house to get the drivers cool on this very hot weekend. As always to my lovely wife who lets us go and play on her birthday. She and my daughter (Katie) placed 2nd for their age groups in their first 5K together this weekend. Katie also earned a Blue Ribbon for her visual arts project and her lamb was 4-H Grand Champion at the Lake County Fair. WAY TO GO GUYS! Jason, sometimes it’s the cart, sometimes it’s your dad, but when you win, it’s all YOU!! I am so proud of you, and so happy you and your dad are getting time together at the track. My dad and I used to sit on the curb and identify the makes of the different cars that drove by. This was back when cars looked different from each other. 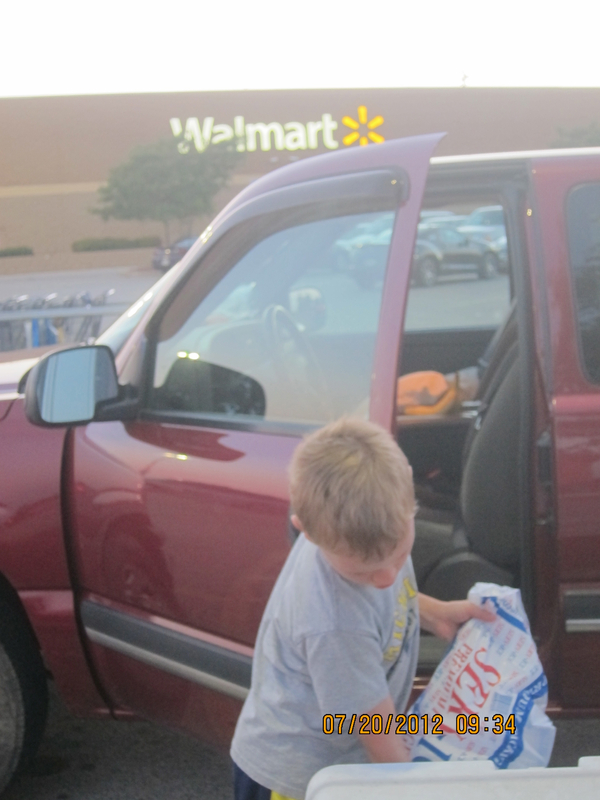 Cars and and Dads — it’s the best!